Bishop who stole from the Orphan Funds. Bishop who stole from the Orphan Funds of Tuam's Mother and Baby Home & St. Anne's Orphanage Galway City, and other Orphanages in the West of Ireland. “The Irish Bishop stands on ceremony and sits on everybody,” Seán O Faoláin wrote. Our politicians were kissing the bishops on all four cheeks. In the 1960s, the Irish Government made a grant of £40,000 to the Orphan Fund but only £20,000 appeared in its account, the other £20,000 disappeared later. A degenerate Prince of the Catholic Church stole the Orphan Funds from vulnerable Orphans at, St Anne's Orphanage at Taylor's Hill, Galway City, where a few hundred babies died as a direct result of this actions. Bishop Browne stole only to maintain his luxurious self-indulgence lifestyle, of decadence and greed. Meanwhile a few hundred or thousands, of vulnerable babies in his Orphanages in Galway and Tuam died from thirst and hunger. 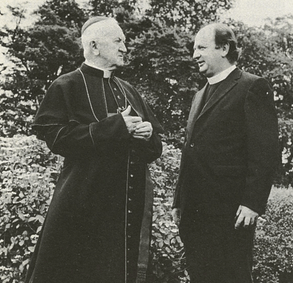 Bishop Browne stole because he could, there was nobody in Ireland to challenge him. The orphanage, St. Anne’s soon after closed down, the Orphan Funds were plundered by the depraved Bishop. Bishop Browne, who offered an excuse, for the other £20,000, he STOLE, he said-"he wanted to divert the other £20,000 to finance sending middle-class priests abroad for the missions", while babies in their hundreds if not thousands died in St. Anne’s Orphanage and also in Tuam’s Mother and Baby Home where 796 babies died and were flushed into a Septic Tank, most of the babies died from malnourishment in both Religious Institutions. 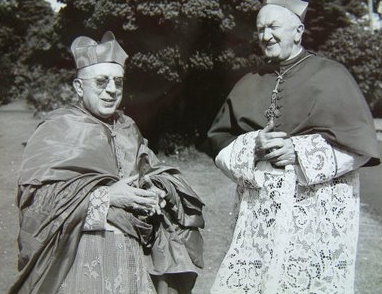 Bishop Brown was also Bishop of Tuam, so in reality the criminal mobster Bishop Browne stole the entire £40,000 Orphan Fund and more and got away with it. The Irish Government let him, they didn’t even ask him where the money went to, they were afraid too, as were the Irish Police, The Garda. It would appear now, that the grant monies for the orphans from the Irish Government were stolen every year by Bishop Michael J. Browne. How much was in the Orphan Fund before the £40,000 was stolen? Why was there no oversight of the Orphan Fund? Why when the entire Orphan Fund was stolen of £40,000 did the Irish Government not order an investigation of the criminal theft of Orphan Funds? Where did Bishop Browne get the new found money of £40,000 to replace the £40,000 he stole from the Orphan Fund? Why was the Garda, the Irish Police not called into the matter, after all it was Tax Payers money, the £40,000? Was this the first time the Irish Government paid into the Orphan Fund? Did it pay money into the Orphan Fund yearly? Was it paid every year by the Irish Government ? Was there other monies collected locally? Why destroy all the documents? Was the stolen monies used to built Bishop Browne’s monstrosity of a Cathedral in Galway City, which was completed in 1965 with the help of the stolen Orphan Funds? The Bishop of Galway Kilmacduagh and Kilfenora and the ecclesiastical province of Tuam, Michael J. Browne, was a person who was self-indulgent in his fondness for sensuous luxury. He STOLE the entire £40,000 Irish pound directly from the funds for Orphans in the late 1960s, which would be equivalent to approximately €400,000 in today’s money. When Bishop Browne was confronted, he reacted furiously when challenged by a delegation of local businessmen about the STOLEN Orphans Fund. The stormy meeting took place at the Bishop's palatial Palace at Taylor's Hill in Galway city in the 1960s and ended with Bishop Browne being given an ultimatum to replace the money or face exposure in the media. It is now easier to join the dots, Bishop Browne got money from the Irish Government every year for 40 years of his reign. Be sure that the money didn’t go to the Orphans in his parish, the Orphan Fund money he used to maintain his immoral lifestyle and also to built a carbuncle Cathedral. Also the illegal selling of stolen Babies from both the orphanages, St. Anne’s and Tuam’s Mother and Baby Home, raised a few million more, also used to fund Bishop Browne and his pet project, Galway Cathedral. Bishop Browne built Galway Cathedral which is one of the city’s largest buildings with its huge octagonal dome. At that time, millions of Irish pounds was used to built and millions more to furbish the interior, with marble and gold. All built on the blood and bones of the Orphan babies and children that died from hunger and thirst, dumped and disposed into mass graves and Septic Tanks in the Orphanages he controlled, both in Galway and Tuam’s Mother and Baby Home. It took 8 years to complete the new Cathedral with Galway limestone, it took the same 8 years to destroy over 1,000 rejected babies who died from lack of food and water, while Bishop Browne stole the Orphan Funds and built both his decadent lifestyle and his extravagant Cathedral. The controversy arose over concerns by the Sisters of Mercy who ran St Anne's Orphanage at Taylor's Hill, less than 200 yards from the bishop's residence. Also known as Lenaboy Castle, which was built in 1859. It was run as an orphanage for children born in the city’s Magdalen Laundry from 1925. Lenaboy Castle, also has a secret Septic Tank, and many locals have said that it was imperative that archaeological work be conducted at Lenaboy Castle, to fine the bodies of hundreds of children secretly dumped there. The health of the orphan children at Lenaboy, according to Dr Anna McCabe, said- the children are ’looking emaciated, cowed, dirty and unhappy'. Also the Dr. found that their diet had been- 'reduced almost to starvation level' and comprised 'half a cup of milk a day, no tea, practically no butter or sugar, tiny portions of meat and vegetables, consisting largely of the unsaleable portions of the school's vegetable garden'. The bulk of their food was cocoa, bread and dripping. Two thirds of the children also suffered from scabies. Many died of starvation. Catherine Corless said—“The thing is, I’m anxious that every little bit of evidence gets out there, just in case Lenaboy Castle is a carbon copy of Tuam. A woman claims she saw a little boy going out in a cardboard box. It just deserves a lot of questions and more evidence”. “I have the evidence of one man who said he would have seen corpses laid out on the slabs,” she said. And “Some of these boys, now men, told Corless about corpses on the grounds”. It was claimed that the STOLEN money was duly returned to the orphanage account within a matter of days. A spokesperson for the Sisters of Mercy said “it was highly unlikely that any of the Sisters who might have known about the controversy would be alive today.” The records for the orphanage dating back to the late 1960s would be sketchy at best, and were destroyed by the Bishop. The problem with Bishop Browne, was that he used the STOLEN money from the Orphan fund to fund his expensive Champagne Charlie lifestyle, a debauched life of luxury and excess at the expense, of the unfed and dying Orphans, of St Anne's Orphanage just a few hundred yards from his grand residence, a palace. As a result of his criminal actions, we can reveal the extreme dehumanisation of hundreds if not thousands of Orphan Children who died directly from lack of basic food. The greedy Nuns at St Anne's Orphanage encountered countless Children every day who were so weak, diseased, and malnourished that they could barely walk or carry out their basic life functions, all died within weeks, because there was no money to buy basic foodstuff. There was nobody to weep at the horrors seen in St Anne's Orphanage. The pain and suffering felt by the Children was unbelievable as was their unnecessary deaths. The inhumane conditions and the torturous treatment of the Orphans only further revealed the true cruelty and brutality behind Bishop Browne’s leadership and the reign of the Cult. The unimaginable cruelty of many practices of the tyrannical Nuns the sheer brutality committed on the babies, the illegal medical experimentation, and starvation performed on them. Further more, nobody ever bothered to ask where he got the extra money he used to return the STOLEN Orphan funds from. Bishop Browne simply stole the new money from another Orphan fund he controlled, after all he was a Prince of the Cult, he was immune from all civil laws in Ireland, he was answerable to nobody. There was no oversight of his actions, all the locals, Police, Council Officials, Government Officials were all afraid to do their basic job. Who cared, it was only spawns of the devil. The dregs of humanity, scum, Orphans of whores who worked in the nearby Magdalene Laundries according to the Cult. The dehumanisation of the Religious run Institutions is well known, as The Cult’s propaganda frequently likened the unwed women and there children, including Orphans as vermin with infectious diseases. By the way, the other Orphan Funds Bishop Browne controlled and plundered for his debauched lifestyle was from the now infamous Tuam’s Mother and Baby Home, also in County Galway, where we now know 796 emaciated babies and children where dumped, Orphan- rejects, flushed into the Septic Tank, and another 1,800 to be soon discovered, dumped under the children’s playground nearby. Sadly there would never be neither public nor Irish parliamentary discussion of the inhumane conditions in any of theses Religious run Gulags, the act of dehumanisation of Orphans, and all the women and children in the Gulags was a slippery slope towards their violence and further atrocities that the Cult knows it got away with. There were thousands of emaciated children in all these Religious run Gulags in Ireland, many died. I know this from my own bitter experience, I was 18 years in these hell holes, now it is the time for true Accountability. "The bishop had a round soft baby face with shimmering clear cornflower-blue eyes, but his mouth was small and mean. Around his great neck was an elegant glinting gold episcopal chain with a simple pectoral gold cross. He wore a ruby ring on his plump finger and wore a slightly ridiculous tiny scull cap on his noble head. The well-filled semi-circular scarlet silk cummerbund and sash neatly divided the lordly prince into two."